Returning this year we are offering a brand new version of 'Chernobyl - Inside the Exclusion Zone'. This 2019 version of the 8.5 x 11 spiro-bound calendar lays flat and also comes predrilled for hanging. A full grid calendar for each month enables you to use this handy calendar throughout the year to make notes of your important events. Chernobyl - Inside the Exclusion Zone features previously unpublished images offering a rare glimpse inside Chernobyl's Exclusion Zone, a 30km restricted area around the infamous nuclear reactor that exploded in 1986 poisoning the air with radiation. These images capture the forgotten world inside the city of Pripyat; once home to almost 50000, now abandoned after its inhabitants were permanently evacuated days after the accident. 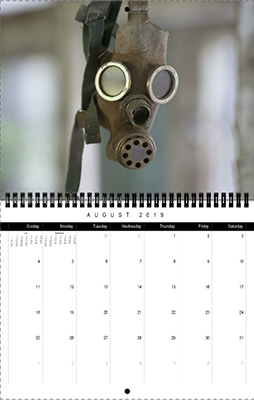 Each month features a different image.